You might be wondering if it is permitted to remove Navbar from a website that is hosting on Blogger Platform. It turns out that having Blogger Navbar on your blog is optional as is evident by this answer on Google Blogger Forum. So now that we know that removing Navbar is allowed, lets go down to business. Note:You can also just hide the NavBar by going to Dashboard > Layout and click on top right widget named Navbar and select Off. In this case changing of the template is not required but the downside is that the space the Navbar occupied will still be there. In my opinion this is even worse than having a NavBar, since you will have empty space for no reason. First it is always a good practice to back up your current template before doing any modifications to it. Go to Dashboard > Template and click on Backup / Restore button located on the top right corner and choose Download full template. 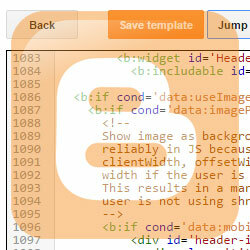 Switch to Dashboard > Template tab and click on Edit HTML button and then also on Proceed button. Template code will show up. Find the end of </header> tag and start of <body> tag. You should find those tags by scrolling around ¾ down the template code. In both cases, the Navbar at the top of the page will not be shown. Which one you choose really depends on how often do you edit posts and widgets directly from your website. you want to keep the ability to edit post edit widget directly from a website. you don't mind losing those icons for editing posts and widgets directly from a website. you think you will not revert Navbar back as the code will be removed from the template. you want to speed up your site a little. Since Navbar functionality will be removed, fewer resources will load during each page load and your page speed will improve. Note:When NavBar was deleted from this blog, loading time of a page was reduced by around 200ms. This is it. Now every page on your web site will be missing Blogger Navigation Bar. If you would like to know more about modifying Blogger Template, read the following post: How to modify Desktop / Mobile Template? I mistakenly turned off the Navigation Bar. My Blog is hosted with my website with a hosting company. I have no way of logging into my blog to make any corrections because the nav bar is not there. I can get to my blog files via my cpanel and MAYBE could fix it but don't know the name of the file the nav bar is in. The only reason a Blogger site would use a cPanel is to have a custom domain. This means that site is still hosted at www.blogger.com. Go there and sign in with your Google Account (usually the one used when you first started with Blogger) and you should be able to have admin access to your Blog. I hope this will help you with your issue.